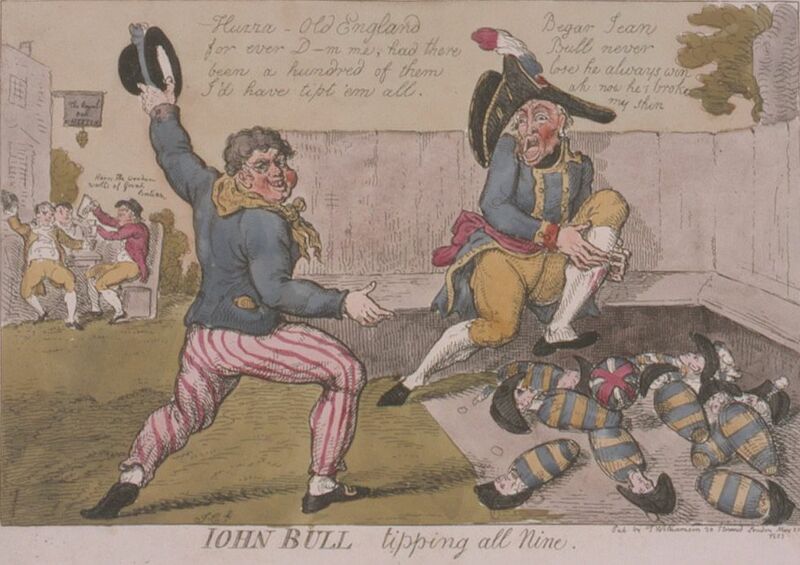 Hand coloured etching entitled 'John Bull Tipping All Nine' by Isaac Cruikshank, published by T. Williamson, London, 18th May 1803. Caricature shows a scene in a pub skittle alley. A triumphant British sailor, wearing a neat blue jacket, red striped trousers, and yellow silk kerchief waves his hat exultantly in the air, as he knocks over all nine skittles in one go, with a ball painted in the colours of the Union Jack. Each skittle is painted in the French colours of blue and gold and each has the tiny head of a French officer, wearing a cockaded hat. On the right a grotesquely ugly, elderly French general (not resembling Napoleon), wearing a tricolor cockade and sash, clutches his bleeding leg, exclaiming 'Begar Jean Bull never lose, he always wins ah! now he broke my shin'. In the background men sit around an inn table outside the 'Royal Oak - A. Neeson (Nelson)' drinking a toast to the 'Wooden Walls of Great Britain'. This is a reference to British victories at sea and the receding threat of invasion from France during this period. This John Bull Tipping All Nine Art Print is created using state of the art, industry leading Digital printers. The result - a stunning reproduction at an affordable price.